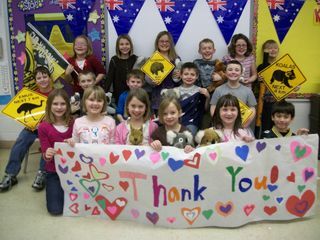 My second graders in Wisconsin have been corresponding with a class in South Australia since last fall. They wrote letters and I would usually type them because they did not have enough time during their computer lab time to type a letter. In January I decided to try and get some computers for our classroom through Donorschoose.org, so my students would be able to use them throughout the day. If I could get enough small computers, I would be able to create a center for my students. We are the luckiest class ever! HP came through with a match offer on Donorschoose in January for teachers who ordered HP products, and Craig Newmark answered my Twitter request for help funding a netbook center. We now have six netbooks and I have set up the netbook center in the front of our classroom. The students are using the netbooks for many subjects. They have typed letters to their e-pals, parents and even to some very famous people. Bookflix and Tumblebooks are two of their favorite sites to listen and read storybooks. Coolmath4kids.com is their favorite math site. I have tiny notebooks next to each computer with the URLs of their favorite websites. They are all quickly becoming computer gurus! Our netbooks have media slots, so my next project involves the camera that Craig helped fund for my students. I plan on teaching them how to use it and then they will take all kinds of photos to share with their friends in Australia. Hopefully, I will be able to show them how to do some basic editing and then create slideshows to share with others. None of this would have been possible without Craig’s help. My class and I are so grateful and we cannot thank him enough for his generosity! Hopefully, the photo conveys just how happy my students are with their new netbook center.